We interrupt this NHL Winter Classic to bring to you the 2014 U.S. Women’s Olympic Ice Hockey Team. 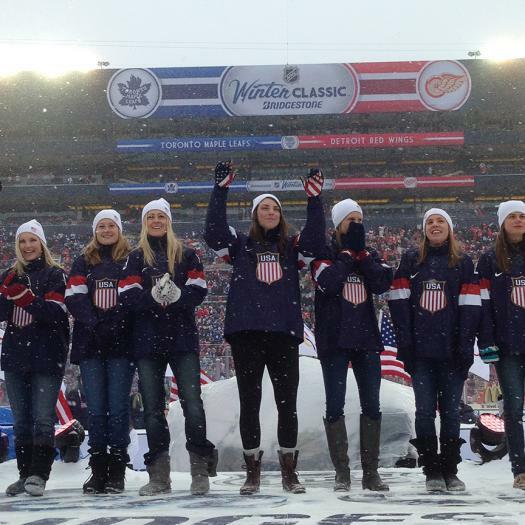 At the conclusion of the second period of the NHL contest between the Detroit Red Wings and Toronto Maple Leafs, the 21 members that will make up the women's squad representing the United States at the 2014 Olympic Winter Games in Sochi, Russia, walked through the tunnel and carefully circumnavigated the frosty football field and leaped onto a stage at the Big House in front of the largest crowd ever assembled to watch a hockey game. 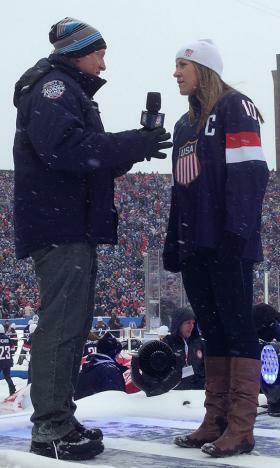 "As [Detroit Red Wings coach] Mike Babcock said earlier it's all about the moments that you share with your team and support staff, and to be able to unveil our 2014 Olympic Team in an atmosphere like the Big House I can't even put into words what that means to us," said U.S. Head Coach Katey Stone. One by one they were introduced, smiled a frozen smile and waved took friends and family back home watching the NBC broadcast before beating a hasty retreat to the warmth of their sheltered suite located high above the Big House. Team USA captain Meghan Duggan stayed behind for a quick interview with two-time Olympian turned broadcaster Jeremy Roenick. The announcement is the final step in a journey that traces its roots back to 2010, not long after another silver-medal showing in Vancouver. The final roster was pared down from 40 players invited to a summer camp in Lake Placid, N.Y., with the final two cuts coming just before Christmas at the conclusion of an exhibition game in Grand Forks, N.D.
And even though the team appears to be firing all cylinders now with four straight wins over Canada, Stone said there is more work to be done once the team returns to Boston to continue its work up, that includes a half dozen scheduled scrimmages against local Midget teams. "We're going to spend some time working on the little things, face offs, honing our skills on the special teams, presenting a few different looks that we haven't shown to date," Stone said. "We're going to make sure that everyone understands, regardless of the situation we're in what their role is over the next month." The announcement of the U.S. Women's Olympic Team has dramatically changed over the years. And who should that better than Julie Chu, who will be appearing in her fourth Olympics. "It's just keeps getting smaller and smaller. I don't understand it," Chu joked hours after taking center stage in front of 105,000 rabid hockey fans and a national television audience. "The Mall of America [the site of the 2010 announcement] is always special because it's so iconic and Minnesota is a great hockey state, but you can't beat the Winter Classic. To be in a stadium like this filled with passionate hockey fans and an amazing shoot out game, it's pretty special. I think that's again a testament to the growth of our game." With the announcement Chu will join Jenny Potter and Angela Ruggerio as the only American women to participate in four Olympics. "It never gets old," said Chu, who made her debut with a U.S. National Team in 2000. To put that in perspective, Lee Stecklein and Alex Carpenter, the youngest players on the Team USA roster, were 6 years old at the time. "Even having a chance to wear the jersey today even with all these clothes underneath it's special. Any day that I get to be in a National Team jersey is a great day. I've been blessed to be on the team since 2000 and I've never taken a day for granted and I'm not about to start now." The loudest cheers among the capacity crowd filled with Leafs fans who made the pilgrimage south to Ann Arbor were reserved for Amanda Kessel, the sister of Leafs star Phil Kessel. The crowd chanted "Kessel's sister" as the players left the stage, and later cheered when Phil walked back into the Big House wearing the U.S. Olympic after being named to the 2014 squad. Lyndsey Fry received the news on Dec. 21 that she would be going to Sochi, but held off telling her family until she returned home to Chandler, Ariz.
"I got a great reaction out of them. A lot of tears," Fry said. Her trip back home was so short, with games in St. Paul, Minn., and Toronto on the docket in the days leading up to the team announcement that Fry hasn't had time to let the news sink in. "I was talking to one of my friends about it and he said that it will hit me when I'm sitting on my couch in March," she said. As the first Arizona native to make a U.S. hockey team, Fry can only hope her selection inspires other local hockey players to dream big. "I really hope that it can help grow the sport and that little girls and boys everywhere they can get here. I'm glad that I can prove that now," Fry said. "The hockey community back home is relatively small and that makes it such an awesome support system. I feel so much love from all of them." 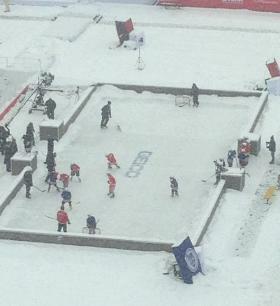 The freezing temperatures did not deter a group of local youth hockey players played a game of shinny on the small ice surface immediately south of the main rink. At the end of every period they would march back out and play while the ice was being resurfaced. The difficult decisions of who to put include and who to leave off the U.S. Men's Olympic Team has its origins in what is being done at the grassroots level. The quality development programs like the American Development Model and the NTDP in Ann Arbor will make the talent pool even deeper in the coming years and therefore continue to make these decisions more difficult for the next GM of Team USA. "The quantity and the quality of USA Hockey players is growing at a fantastic rate," Poile said. "The people involved with the [American Development Model] program and all the things that have happened and will continue to happen, the growth of USA Hockey, the competitiveness of USA Hockey for years to come is going to be there." At first glance it would seem like Ben Bishop of the Tampa Bay Lightning would be the odds on favorite to earn the third roster spot at the goaltender position. The Denver native is playing lights out this season with a 20-5-3 record and 1.89 goals-against average in leading the Lightning to second place in the Atlantic Division. "Our decisions were tough in goal. Really tough in goal," Poile said. "Ben Bishop has been fabulous. This has been the best season that he's had in his NHL career and is playing lights out in Tampa." Jimmy Howard, meanwhile, has not been churning out the hits this season in Motown, with a sub-.500 record and pedestrian (2.76) GAA. And after missing a number of games in December due to injury, Howard was shelled for six goals in his previous outing against Poile's Nashville Predators. Yet it was Howard who will join 2010 Olympic MVP Ryan Miller and Jonathan Quick who backstopped the Los Angeles Kings to the 2012 Stanley Cup, as the U.S. trio in goal. "Jimmy would acknowledge that he hasn't had his best season but when you go on his body of work, 35-win seasons, a fabulous record in the playoffs ... all those things helped to make our decision," said Poile, who has seen more than his share of Howard's heroics over the years. After his cutting teeth in international completion more than a decade ago, The Ogdensburg, N.Y., is excited to represent his country and wear the red, white and blue again. "Any time you get to wear the USA sweater is such a tremendous honor," said Howard, who backstopped the U.S. to a gold medal at the 2002 IIHF World Championship. "Back when I was with the U.S. program my senior year in high school was 9-11 so it was a little bit of a rallying cry for us heading into the Under 18s." Coming off a solid outing at the Winter Classic, Howard is hoping that the new year will bring a reversal of fortunes as he looks to push Miller and Quick for the No. 1 spot between the pies for the U.S.
"The competition [with Miller and Quick] is a good thing," he said. "We're going to push each other, but in the end the ultimate thing is for the team to be successful."